Debbie and I created some birthday cards this past weekend and I wanted to share them with you. Isn’t this card darling? 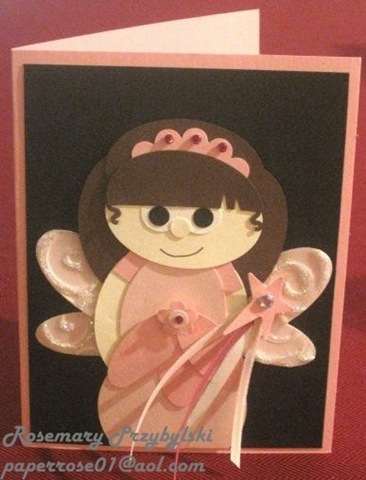 Debbie created this card for her second cousin’s upcoming second birthday. This is done all with punches! I love the rhinestones in her tiara and the glitter on her wings. The little curls are punched from the “string” of a balloon punch! Great card for a perfect little girl! Happy Birthday to Debbi’s brother, Russ! When he was a teenager, Russ wore only black, gray, silver and white. His room was limited to black, gray, silver and white. 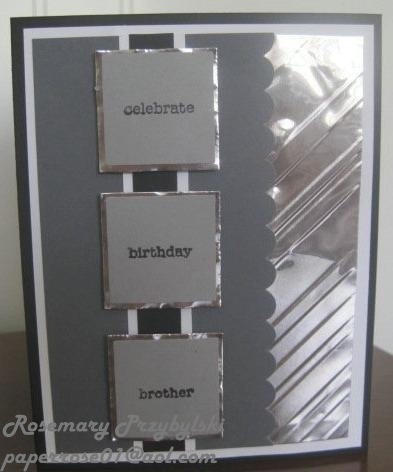 With this in mind, Debbi created a masculine card that is black, gray, silver and white. Thanks to the Big Shot, a Texturz plate and Quick Kutz metal sheets, Debbi was able to add silver highlights to her brother’s card. This was my card for Russ. 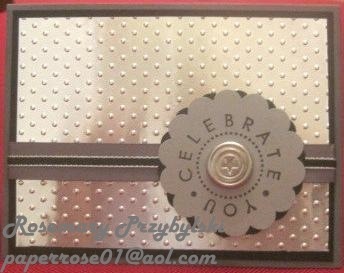 I had an idea in mind, but as Debbi had taken all the punches to prepare for our upcoming Punch-a-Bunch Stamp Camp on September 10th and 11th, I was “punchless!” However, I found the new large scallop circle punch she had left, and I was able to use that to create my interest point. I used one of the retired silver brads in the center to help carry the silver theme through. 5/8” gray satin ribbon with an overlay of the new 1/8 taffeta ribbon finished off my color scheme. Happy Birthday Russ!